Perhaps the most glamorous of all grooming tech put through its paces to answer the ultimate question: what is the best ear and nose hair trimmer? Getting older brings greater wisdom and prosperity (at least on average, statistically speaking), but it's not without its blights. One of the worst is hair, which stops growing on your head, and starts appearing everywhere else. That's why you need the best nose hair trimmers, which also – as good luck and science would have it – are the best ear hair trimmers. With the likes of the Philips Series 3000 you can bid 'adieu' to those horrible wiry curls. The ones that manage to breach the nostrils and irritatingly flicker with every intake of breath, forcing friends and colleagues to stare slack-jawed in amazement and internally debate whether you actually own a mirror. Nose hair trimmers could make a really flattering and great Christmas gift. They'll also probably turn up among the best Boxing Day deals. What is the best nasal trimmer? Based on effectiveness, ergonomics, waterproof casing and additional trimming comb attachments (for your bushy brows), we are going to plump for the Philips Series 3000. Philips is also well versed in the language of grooming and its ProtecTube technology, which sees the cutter protected by an ultra-thin foil guard with rounded tips to prevent skin irritations, offers a good trim without painful catching and snagging. Indeed the packaging even boldly claims, "No pulling guaranteed". The second best option, much as it pains us as the world's leading consumer tech brand to say so, is to buy a pair of slightly curved scissors such as the excellent Tweezerman His. These require a little more dexterity but the clever shape and razor sharp blades mean both safety and efficacy. Modern technology means there is a simple, pain-free solution to unruly facial orifice manes and it comes in the form of an inexpensive trimmer that can be shoved up nostrils and along ear crevices. Prices start as low as £6 for the most basic models, and even the most expensive ones are only about £15 for the more technologically advanced units, meaning they are within reach for even the most miserly shoppers. There are a few things any intrepid nose trimmer should look out for in a product and they are namely the construction of the blades, whether or not the trimmer is waterproof and any additional features that will make the whole experience easier. Blade construction is important, as you ideally want silver or carbon coated steel for the cleanest cut because snagging a nose hair is one of the most painful experiences life can throw at you. Secondly, a waterproof construction allows for easy trimming in the shower, while additional features like a built-in LED light, easily removable and washable blade heads and a neat unit stand make the overall package even more appealing. If you want a short version of the above, try this: buy the most expensive one you can find. It'll still only be about 15 quid. Trust the grooming grandmaster Philips to throw an almost excessive amount of engineering prowess and tech innovation into its nasal strimmer. The angled ProtecTube blade on the Series 3000 makes it easier to reach those tricky areas, while the design of the cutter and guard ensures that all hairs are rapidly sliced to avoid any painful pulling. An angled blade also makes it simple to trim eyebrows, complete with two trimming combs for various lengths, as well as reach those awkward neck hairs or other grooming tricky bits. The combs, as on Philips otherwise excellent OneBlade, do have a tendency to wear out, however, and you can't buy replacements. Also, do remember to use the combs when doing brows because otherwise, you will look like an alien. The 3000 is waterproof, so you can take it in the shower and trim, and the rubberised soft grip means improved control, because no one likes completely bald nostrils. Please note that Philips also does a Series 3000 5-in-1 groomer. This is a decent deal, but the nose hair trimmer included in that is nowhere near as good as this. I'm sure you need me to tell you that this is a pair of scissors. The slight curve and rounded tips make them safe for all but the most shaky of hands, although they do require more practice and steadier hands than an electric, if you want to make the most of them. Italy's Tweezerman sells this as a facial hair scissor, but you can basically use it on any small areas of unwanted foliage. The best 'high end' nose hair trimmer, with a torch no less! Although nose hair trimmers are generally very cheap, the outlier here is this Panasonic, which weighs in at a spendy £30. It's questionable whether it does a noticeably better job than the Philips Series 3000, but it does have a bright light built in, and some may prefer the chunky, grippable shape. You can use it in the shower, like the Philips, although unless your shower is mirrored, you do rather lose the benefit of the light. The interchangeable heads on this trimmer are a nice touch, as they allow for easy and pain free nostril mowing via a rotary head, or more precise brow hair shaping with the dual sided vertical trimmer. Swapping heads couldn’t be easier and the silver coated, anti-bacterial blades prevents build up of bacteria that can play havoc with sensitive skin. A simple one-button cleaning mechanism is also an additional bonus, while the plastic construction can withstand a strimming session in the shower. That said, the rotary style nasal trimmer is a little conservative and can often require a few attempts to tame really stubborn hair. It is very affordable, though. Another trimmer that features dual-edge blade technology, the Panasonic ER-GN30 uses a similar rotary system to the aforementioned Remington. The key difference here is the cleaning technology, which has been designed to remove any jams quickly and efficiently. Users simply submerge the blades in water, hit the power button and water is sucked up into the blade unit and ejected from the top, hopefully along with the big hairball that's causing the blockage. Again, the rotary system is nice and safe but it does require a bit of fiddling and fettling to get the desired results. The upshot is that it doesn't pull nose hairs like some mechanised trimmers, nor does it pose the same risk as wielding a pair of scissors around sensitive nostrils. If VFM is all you lust after, try this neat BaByliss unit. It offers three interchangeable heads for the price of once, offering a wider scope of trimming options at a bargain price. The trimmer itself isn't 100 per cent waterproof, so probably best not take it in the shower, while the vertical blade can be a little noisy when operating, but it does do a good job of shaping beards and getting rid of unruly neck hair. 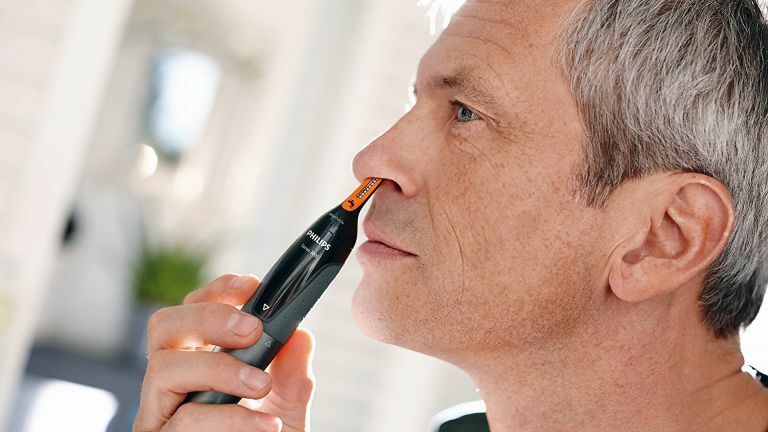 A rotary nose and ear trimmer takes care of the in-ear and up-nostril stuff, while additional blades help with general grooming of beards and sideburns. Yes, you can get a trimmer for six quid. No, it's not amazing, but what do you expect? None of these trimmers are expensive, but this one can usually be found for the lowest price of the lot. As such it isn't likely to win any awards for build quality or longevity, but it does get on with the task of trimming hairs. Powered by a single AA battery, the unit features both a nose clipper and interchangeable trimmer that can be used to shape beards, sideburns and other hip facial hair. The rotary nose and ear blades are carbon-coated, for improved trimming efficiency, while the box also contains a stand, so you can proudly display your nose hair trimmer on the mantelpiece for visitors to admire.